Get the party started in style! An Airport Transfer That Turns Heads! When your group touches down in Barcelona, you’ll want to get the party started ASAP. 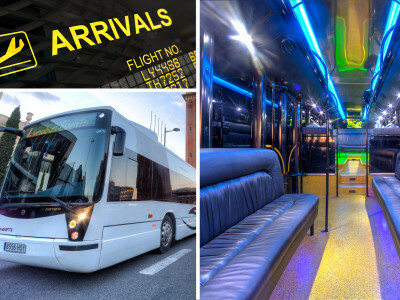 Our party limobus airport pickup helps you get your stag do in Barcelona off to a rocking start, and reach your accommodation in style! The Limobus is fully kitted out with everything you would expect from a top-class limousine, but it is also packed with MASSIVE extras: 3000w speakers, two bars, disco balls and ceiling lights. Before you know it you’ll be cruising through Barcelona’s city centre with cava in hand, music rocking and drinks flowing!